I see in the news that some legislators want the state department of health to save lots of money by going “back to the 1900s” and, instead of treating people in county health clinics, they could just hand out educational brochures and stuff. Today’s newspaper article, from 1938, may be too late in the 1900s to be of assistance in guiding this new/old approach, since it appears that actual health care by real physicians was intended at McComb’s health clinic. On a more serious note, I had never heard of the Commonwealth Fund of New York and had no idea that they were building county health clinics. This makes them just one of several northern philanthropies, including Carnegie for libraries and Rosenwald for African American schools, making their mark on the Mississippi landscape in the form of new buildings in the early and mid 1900s. The Commonwealth Fund’s Colonial Revival health clinic in McComb is now used as a city hall annex, and the health department has moved out to the highway, possibly into a remodeled grocery store at 114 Presley Blvd. 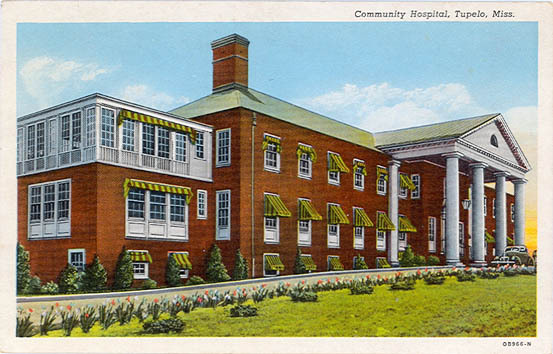 Pike County Health Center, McComb (1938), donated by the Commonwealth Fund of New York. McCOMB, June 10–Barry C. Smith, general director of the Commonwealth Fund of New York, formally dedicated the Pike county health center which was recently completed here as a gift from the Commonwealth Fund to Pike county. The dedicatory service, held at the First Baptist church, was attended by a large crowd, including representatives of practically every governmental and civic group in the county. Smith dedicated the building “to the spirit of cooperation which prevails between public health workers and physicians of Pike county,” commending these two groups for the program that has been made in this section. Throughout the day a host of people thronged the Pike county health center, adjacent to the McComb city hall, inspecting its conveniences and its array of modern equipment. The building was opened to the public and members of the Pike county health department staff escorted groups through the rooms, explaining the function of each. J. Oliver Emmerich served as master of ceremonies at the dedicatory service which began at 2 p.m., introducing Mayor Xavier A. Kramer for a brief welcoming talk. Mr. Smith was then introduced for the dedicatory address. After Smith the following were introduced: Miss Barbara S. Quin, assistant director of the Commonwealth Fund; Dr. Clarence L. Scaman, director of the division of public health of the fund; Dr. W. F. Walker, director of the division of health studies of the fund; members of the state board of health; Dr. T. Paul Haney, Jr., director, and the staff of the Pike county health department. Members of the board of supervisors were then presented after which the following members of the health center board of trustees were introduced: Mayor Xavier A. Kramer; City Commissioner A.B. Barclay, W.R. Watkins, High L. Simmons, W.C. Price, E.E. Stewart, E.C. Fortenberry, Stennis Johnson, Donald P. Dunn. City Commissioner W.O. Rutledge was also presented. I wonder if the Pike County Clinic had a New York architect or a Mississippi architect? The Rockefeller Archive Center has a large collection of the Commonwealth Fund files. Apparently they maintained a program here from 1931-1947. Fellowship files within this series are arranged alphabetically, first by state and then by last name of recipient. Biographical/Historical Sketch: The Commonwealth Fund announced in late 1929 a new project that began operation on January 1, 1930, and promoted rural health and medical service in the United States. The program, instead of emphasizing child care, comprised all health services in rural communities. Initially the project was limited to two states, Tennessee (1930-1945) and Massachusetts (1930-1945), and to two counties or districts in each state. Later the program was also active in Mississippi (1931-1947), Oklahoma (1938-1949), Alabama (1938-1942), Arkansas (1945-1947), California, Florida (1945-1947), Kentucky (1945-1947), Louisiana (1946), Maine, New Jersey, Ohio, Virginia, and Washington. Dr. William J. French, the first director of the CF’s child-health demonstration in Fargo, North Dakota, and former head of the CF’s Austrian Program, was named director. French resigned his post on April 4, 1931, and on May 15, 1931, Clarence L. Scamman became the new director of the Division. The goals set forth were to create field units to promote rural health service and develop well-rounded health services. The work was conducted with the cooperation of the states’ health departments. The project also included the establishment of scholarships for graduate study by rural physicians and for nurses and teachers who wished to study methods of health education, and scholarships or loan funds for medical students who would undertake rural practice. Very prominent New York architect James Gamble Rogers designed it. Rogers was Edward Harkness’s favorite architect, so since his family established the fund, and he was president of it; he hired his favorite architect to design whatever the fund was funding. There were two other small town health centers funded by the Commonwealth Fund and designed by Rogers at the same time as McComb’s. Those were in Blountsville and Trenton, Tennessee. Someone with more time on their hands than I have at the moment could do some Google Street Viewing to see if those two Tennessee ones match our Mississippi one. I wish the Avery Library’s finding aid of there collection of Rogers work was available online. They only seem to have a hard copy available. I got the project list from the book James Gamble Rogers and the Architecture of Pragmatism by Aaron Betsky, part of the discontinued but excellent American Monograph Series published by the defunct Architectural History Foundation with the MIT Press. An appendix has Rogers’ complete project list. Also, Rogers designed the Lauderdale County Health Center in Meridian in 1939 and the Jones County Health Center in Laurel in 1943. That was the only project he completed during World War II, as hospitals were one of the few things considered vital and allowed to be constructed under wartime rationing. These three health departments in McComb, Meridian, and Laurel are the only three Mississippi projects for Rogers. I had seen articles about the Meridian and Laurel clinics. They mention just about everyone in town but who designed and built the dang buildings. In that same search I also came across an article for a clinic that the city of Tupelo was pursuing in 1936 that would cost $300,000.00+. I figured with the depression limting any matching funds the county or city could muster and the stiff competition for the funding from other cities, the Tupelo proposal never got build. Interestingly enough the one entry in the MDAH HRI db for James Gamble Rogers is the c.1950 North Mississippi Community Hospital. I wonder how that attribution came about? Seeing as Rogers died in 1947 the building must have been designed much earlier. James Gamble Rogers and the Architecture of Pragmatism does not have that project listed for Rogers. Perhaps his successor firm modified Rogers’ design or created a new one? I’m not sure i understand the c.1950 attribution in the MDAH HRI. The sanborn map lists the structure as having been build in 1937. It had a hipped roof as late as 1949, perhaps the 1950 date is one where the hipped roof was removed? 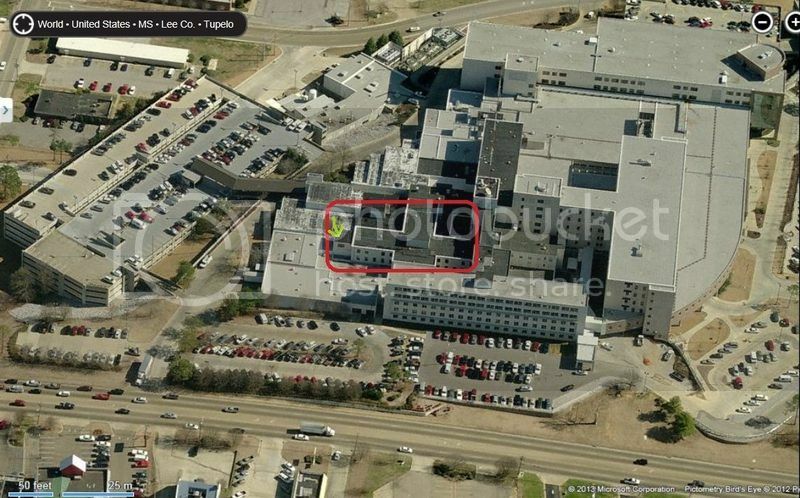 Finally found a photo of the Tupelo Hospital built with aid from the Commonwealth Fund. As far as i can tell, parts of this building still stand in the center of the North Mississippi Community Hospital. See if this one works. Feel free to delete my posts that I mess up! LOL. If photo appears, the red block shows original building. The arrow points to the north sunroom shown on the vintage postcard image. It will be recalled that the fund will put. up $200,000 to $275.000 in the eligible community selected that will supply $40.000 to $60.000, the site, and guarantee operating costs of the hospital. Apparently it was the 1936 tornado that delayed the construction of the commonwealth hospital in Tupelo. Here is the other part of the question answered. McComb, Dec. 17—Ground was broken Thursday for the construction of the Pike County health building which will be built adjacent to the McComb City Hall through a $60,000 gift from the Commonwealth Foundation of New York City. The building contract was awarded Dye and Mullins, Columbia contractors, and Ray Williams, McComb, today began excavation for the building under a subcontract.